You can cancel your account at any time, no questions asked. When you cancel your account, your website becomes inactive. 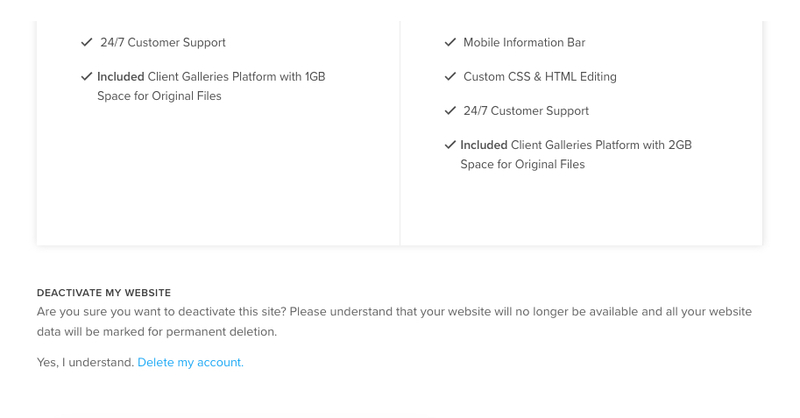 Your site’s content is archived and placed in our deletion queue. You will not be charged again after you submit the request for your account cancellation. Click on avatar icon on black sidebar to go to subscription page. You would see the deactivate option. All monthly subscription payments made to Pixpa are final and non-refundable. For yearly subscriptions, we will be able to refund any payment made in the last 30 days only. Yearly subscription payments made more than 30 days ago will not be refunded.